La Carraia- this Florentine institution is located just off Ponte La Carraia, the second bridge after Ponte Vecchio to the east. This gelateria is famous for it’s speciality- pistachio and white chocolate. Delizioso– and a must if you visit this place. 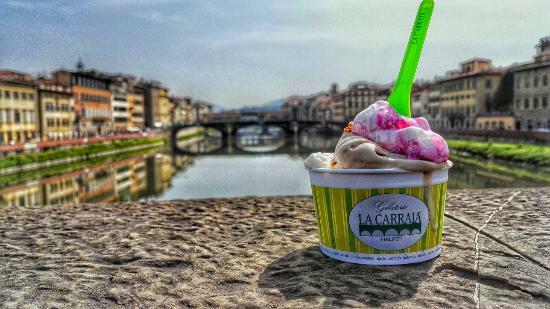 TIP: La Carraia also has a smaller shop on Via de’ Benci not too far from the Uffizi where you can get one scoop of gelato for just a euro. 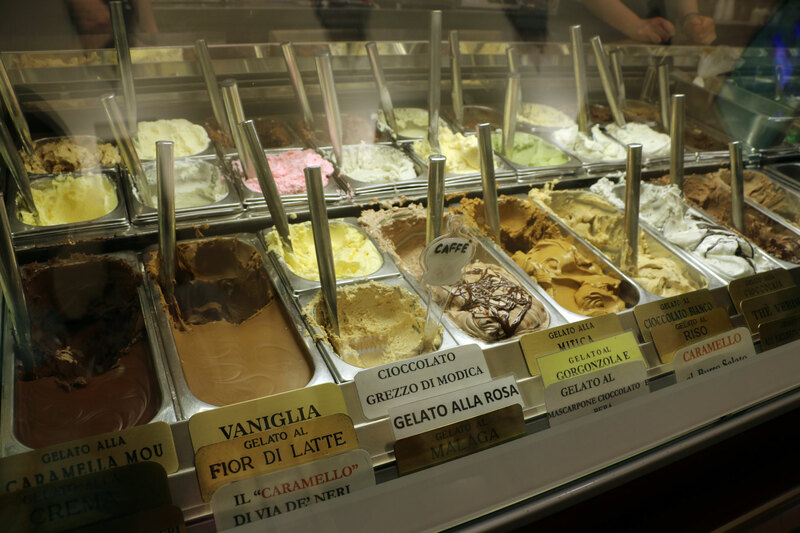 Rivareno Gelato- this gelateria is located really close to the Duomo on Borgo degli Albizi and is another place to get gelato made with fresh ingredients. It offers some unusual flavours and innovative combinations such as marron glacé, the Leonardo pine nut flavour and the Alice which contains marsala with white chocolate. Gelateria Dei Neri- this place is located just off Piazza della Signoria on Via de’ Neri which is a great street for finding local shops and osterie. This gelateria offers delicious, creamy gelato for very reasonable prices. If you like nutty flavours, try the Gorgonzola e Noci or Ricotta with Pistachio flavour. My favourite flavour is hands down the Buontalenti one, named after the 15th century Florentine artist who is said to have invented icecream. GROM- this is a chain gelateria which originally began in Turin and now has shops all over the world in places such as New York and Dubai. Don’t be put off by the fact it’s a chain though- the gelato is made fresh daily and contains high quality ingredients such as Gianduja chocolate and Guatemalan coffee. I really like their speciality ‘Crema di Grom’ which contains biscotti and Colombian chocolate chips and their bacio flavour. Don’t fall into the tourist traps and avoid buying gelato around the main piazzas such as Piazza del Duomo, Piazza della Signoria, etc- if you don’t you might end up paying up to €10 for a paltry two scoops in a cone. Avoid gelaterie with mountains of gelato piled up on display- this gelato is exposed to the air for far too long and will have melted into a sticky fructose mess before they’ve even put it into a cone for you. The quality of these ice creams is generally abysmal too. One of my friends told me of a girl who once went into a gelateria just off Ponte Vecchio (tourist central) and ordered a nutella icecream. She was handed a cone with pure frozen nutella. 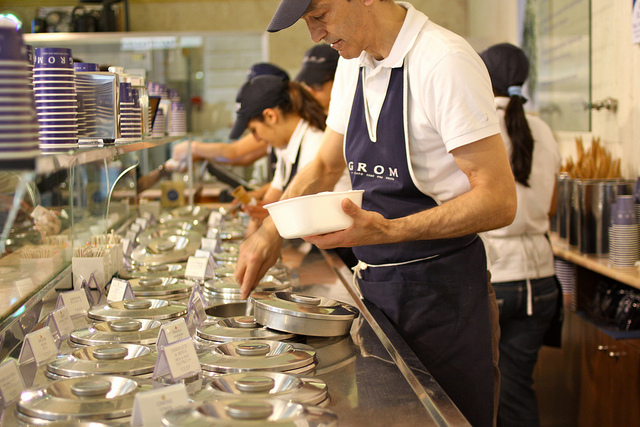 Instead, look for gelaterie that use silver canisters covered with lids to store their gelato- this will be stored at optimum temperature and is a sign of a business that’s serious about it’s produce.